question and I haven't gotten back to you. It's just been more than I can handle. My friend has set up a website for Shawn. If you would like to attend and need the address, please send me a private email! 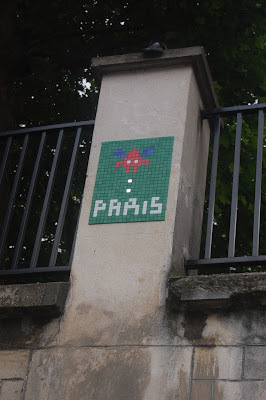 My friend Dan emailed me these photos that he took while in France recently. 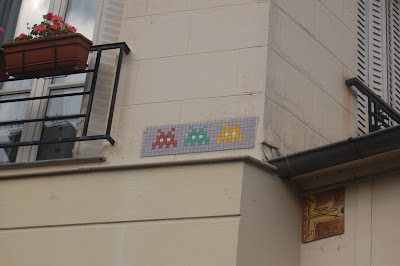 "These tiles were on buildings near the basilica Sacre-Cour in the Montmartre district of Paris." I have settled on Saturday, August 23rd as the final date. I apologize to those who can't make this date! The response has been, literally, overwhelming. Thank you to all who have replied. So far it looks like 200 people may be in attendance, with almost all of those wanting to see Chasing Ghosts. This is presenting some logistical problems, as I can't fit that many people where I was planning on showing the movie (the upstairs of the arcade). I'm working on several solutions, including giving out tickets to specific showings and thereby limiting the number of people at each screening, and also perhaps renting the theater in town to show the movie. More details will follow shortly, but I wanted to get the final date out there. It's been a while since the last Game Day. I'm currently planning on having the next sometime in August. The dates I am looking at are August 16th, 23rd, or 30th. I will be sending out an annoucement when I settle on the exact day, but I wanted to give people a heads up. This Game Day is going to hopefully be something extra special. First, I am planning on having this Game Day be a "benefit" Game Day. I am going to *suggest* that people donate something. Donating will of course not be mandatory. Those who know me or have been to previous Game Days know that I have never asked for *anything* in return. Here is a chance for me to do something good with the arcade. All donation proceeds will go to a Trust Fund for Shawn Haines, the son of some close friends of mine. He is currently undergoing treatment for Hodgkin's Disease Lymphoma. I am trying to set it up so that donations can be made directly into the Trust Fund. More info to follow. As a special treat, I am also planning on showing the popular indie film Chasing Ghosts: Beyond the Arcade. This film made the festival circuit last year, including Sundance, the LA Film Festival, and also screened at the 2007 California Extreme event. Some of you may know that I worked on this movie, providing some graphics and computer animated sequences. I tentatively have plans to have the Producer of the film, Michael Verrechia, to attend and do a Q&A afterwards and I'm going to try and get some of the film's stars to attend. For those who have not yet seen this still-unreleased movie, here is another chance! Snacks will be provided for free, and food will be for sale. We are doing a BBQ cookout at the event with all proceeds for the food sales going towards the local Young Marines organization. Finally, we are investigating getting a Moon Bounce for the event. And of course there will be arcade games! There have been some new additions to the collection since the last Game Day. I will also have a Vectrex console and an Atari 2600 console in operation in the party area for a change of pace. In order for me to start planning, please email the following questionnaire to mail@lunacityarcade.com within the next week or so. [_] BENEFIT? DONATIONS? BAD IDEA. Please return the questionnaire to me as soon as possible! I will be finalizing the exact date in August as soon as I can and will send that info along when I have it.